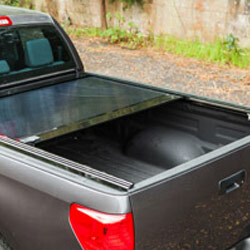 Roll-Up Tonneau Covers are the most affordable cover for your truck bed. They roll up so you have full access to your bed. They add a sleek look to your truck while providing you with a bed that stays dry and clean from heavy rain, snow or hail. The tarp is constructed out of heavy duty material and the bows underneath are made out of anodized aluminum. 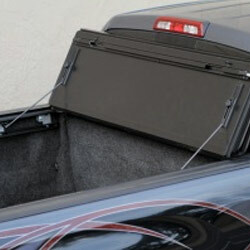 They provide security for your cargo, and quick and easy access to the entire bed. The cover features SunStrong Fiberglass Reinforced Polymer top panels and aluminum bottom panels for security. 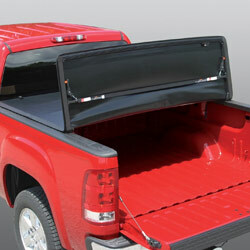 The hinges allow it to fold up all the way to the cab of the truck for unrestricted bed access. 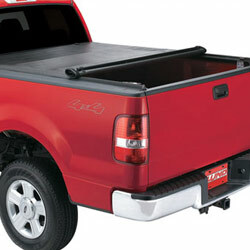 Retractable Tonneau Covers will support weight up to 500 pounds! No matter what kind of weather conditions you find yourself in, your cover and the valuables beneath it are safe and sound!